If you prefer not to book to a test or the patient has an abdominal or rectal mass then please book a clinic appointment via NHS eRferral. The below will help you to understand which is the appropriate test to book. More detail about each of the different tests are contained within the packs. The below table demonstrates what will happen following the GP making the query cancer referral. 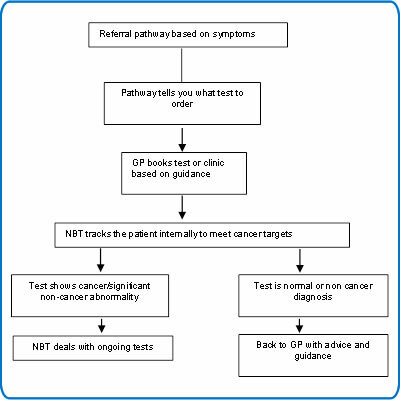 Essentially, if the test result shows cancer or significant non cancer abnormality then North Bristol NHS Trust will pick up the care of the patient and will proceed with possible treatment options. If the results are normal or show no significant abnormality then the care will remain with the GP, although appropriate advice and guidance will be provided. What if your patient doesn't fulfill the criteria? The ICE referral system is set up for patients who fulfill one of the NICE criteria. 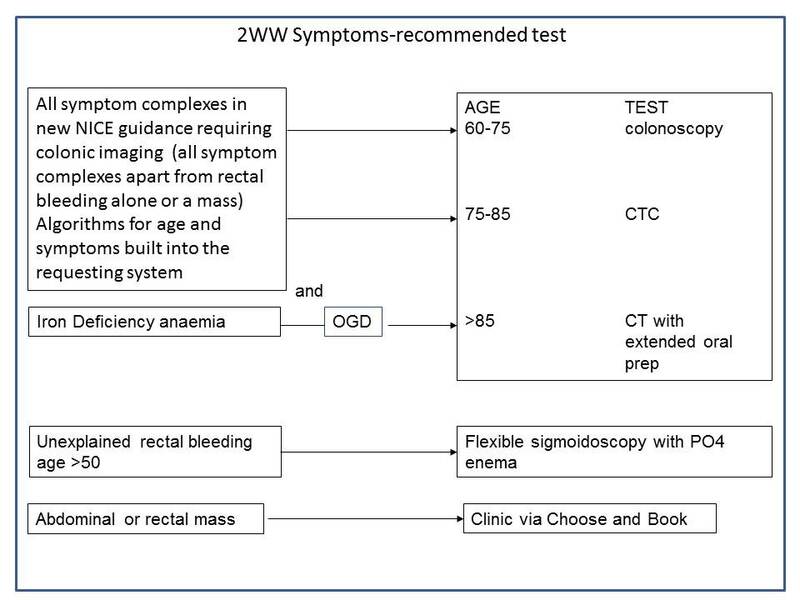 If your patient does not fulfill the criteria you will not be able to book them direct to test. However, these patients can be referred under the 2 week wait if you suspect that they may have cancer. Please refer these patients to a 2 week wait clinic via NHS eReferral. If you have any questions or concerns about the pathway then please contact any member of the colorectal or endoscopy team.